42 | TH E M R EP O RT FEATURE "lead-based" marketing—and it has grown expensive, stale, and unappreciated (to say the least) by the consumer. Today, top marketers are driving results, especially in mortgage, with data-driven tactics using be- havioral and attitudinal data sets. This data is being incorporated into contact strategies to create more sophisticated and individual- ized interactions that generate a positive response. This methodol- ogy is called "people-based" mar- keting. It revolves around insights from a growing set of simple, easy- to-understand data outputs that allow lenders to deliver the right message to the right consumer at the right time in the right medium. The results have been astounding, and the customer experience is dramatically improved, resulting in higher conversion rates. Attitudinal and Behavioral Data A ttitudinal data is information about how a person feels toward a product, service, or their experience with a lender. Simply put, it reflects their attitudes. This dataset is used to form consumer profiles that help the marketer understand how a customer typi- cally buys. Are they a techie who will love the digital mortgage- application process? Will your direct-mail piece immediately go in the recycling bin? Will they be receptive and responsive to text messages? Knowing a consumer's preferences enables a more in- depth experience and optimiza- tion that results in higher-quality conversations and engagements. Behavioral data is the champion of predicting outcomes and de- livering insights based on specific consumer actions. This data set provides clarity on the consumer's changing intent throughout the buying journey. Are they just cu- rious about today's 30-year fixed rate? Do their actions indicate they are ready to buy now? Are they a "window shopper" or seri- ously considering their options? What time of the day is best to reach them? Credit triggers are one solu- tion for measuring a consumer's intent. Unfortunately, it also means they've likely selected another lender and are late in the buying cycle. The same goes for MLS listing alerts. 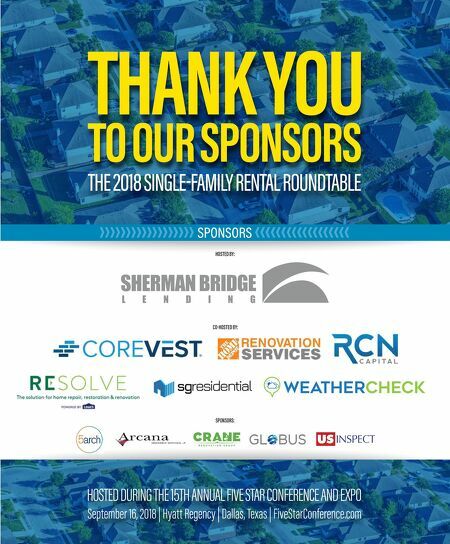 So many lenders subscribe to these services that it's a rat race and difficult to achieve success relying on these as your sole source of behavioral data. However, there are newer sources of behavioral data points available with in-market indicators available well before a credit trigger. These will give you a leg up on the competition, such as time spent on a mortgage-related website, the number of visits to these sites over time, when those visits occurred, and more. These data points are indicators of a consumer's likeli - hood to start the mortgage process and can drive optimally timed calls, emails, and texts. Driving Better Results L enders can spend a fortune on marketing to potential customers and can put an enormous effort into optimizing lead management strategies for maximum returns. Studies have analyzed performance relative to speed-to-contact attempts, and the quickest mortgage lenders achieve a mind-blowing four sec - onds between the time they re- ceive the consumer inquiry and when they dial the consumer. This unprecedented need for speed-to-contact has caused industry marketers to quote Ricky Bobby, Will Ferrell's character in "Talladega Nights," by saying, "If you ain't first, you're last." But with the robust amount of data available to lenders, this is no longer the case. Industry-leading marketers are now focusing on the people behind the lead. They are tailoring their outreach optimized to the likelihood a person will respond positively. People-based marketers are playing chess while others are playing checkers, with the cost of acquiring a new customer improv - ing substantially as a result. Onboarding and taking action on unique data sets are no longer overwhelming tasks. Lenders share basic consumer informa- tion with their DaaS partners to unlock an array of complex and valuable insights delivered in a simple and actionable manner. Regardless of a lender's level of data sophistication, there are a few predefined ways to take ac- tion: simple, matrix, or artificial intelligence (AI). Here's how each of these models works: • Simple models combine a basic understanding of differ- ent groups by quadrants. The consumer is either high or low value, with high or low in-mar- ket activity creating four buckets of high/high, high/low, low/high, and low/low. It deploys a unique contact strategy for each group. This upfront effort to move away from a one-size-fits-all strategy will pay dividends. • Matrix combinations create even more groupings. For example, a four-by-four matrix will cre - ate 16 buckets that are more granular and can include details such as a preferred method of contact and in-market activity. Testing and optimizing these buckets is where the real magic lies. A healthy amount of focus is required to execute a matrix strategy, but the benefit to the customer experience generates far greater rewards. • Though marketers widely dis - cuss AI, it remains a mystery to many. This hyperpersonalized approach is very tempting (and sounds really cool) but is cur - rently limited to lenders with deep pockets and resources. However, the industry is looking at ways to make AI capabilities more accessible for everyday lenders. Gaining a clear view of custom - ers and their preferences is what elevates lender performance in today's mortgage environment. It's becoming easier than ever to con - nect your consumer information with additional data sets in order to paint a complete picture of the consumer with whom you are trying to create or deepen your relationship. People-based marketing has helped improve conversions, create a better customer experi - ence, and save valuable marketing and operational dollars through efficiency gains. Add rich data insights and lenders will drive more timely and relevant interac - tions with their consumers while driving increased revenue to their bottom line. MIKE ESHELMAN is the Head of Consumer Finance at Jornaya, a data-as-a- service platform that delivers consumer journey insights to publishers, marketers, analytics, and compliance professionals with the highest-resolution view of the consumer- buying journey. 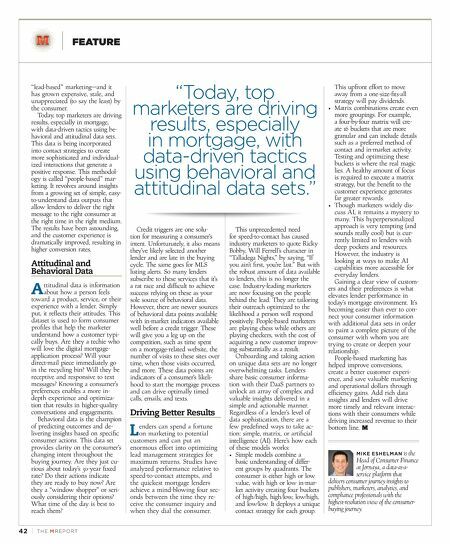 "Today, top marketers are driving results, especially in mortgage, with data-driven tactics using behavioral and attitudinal data sets."